Catch the vision of Project Transformation and invest in relationships! 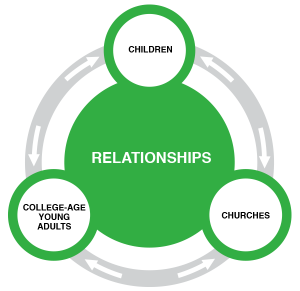 LEARN: Search Institute offers excellent research on what makes a healthy, developmental relationship between adults and youth; this is helpful for parents, youth ministers, coaches, teachers, mentors…you name it! Check out the five essential elements of Developmental Relationships. ACT: Have ice cream with a youth or young adult in your life. Ask them how God is at work in their life, in their dreams. And, then: actively listen. REFLECT: Australian aborigine, Lila Watson, once said, “If you have come here to help me, you are wasting your time. But if you have come because your liberation is bound up with mine, then let us work together.” In outreach ministry, it is easy to get caught in the self-righteous tendency to see the role of “helper” as more valuable than the role of the “helped.” Certainly, the “helper”/“helped” dualism leaves much to be desired for the mutual growth and transformation that God desires for God’s people, for none of us is truly whole without the other. Certainly, those on the receiving end of outreach ministry, “the helped,” have been endowed by God with special wisdom and experience that can change the heart and mind of the “helper.” Healthy relationships, even in ministry, are never one-sided since God is actively present in all. In your quiet time this week, thank God for the relationships in your life, for the ways you both receive and give grace and wisdom. Write a handwritten letter or email of thanks to someone from whom you’ve received grace, freedom, healing, and wisdom along your faith journey.